Can anyone say YUM?!?! This is a fantastic crock pot recipe that I received from my mother-in-law. 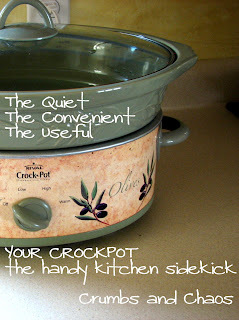 Of course it is pretty easy like most crock pot recipes. We served it over noodles and it was delicious but we have also had it over rice and that was good too. The longer you can cook this the better so think of 10 hours as a minimum. Prepare in your crock pot the night before and then just start it when you wake up! This is the kind of recipe that warms your soul when you walk in the door after a long day; that is my favorite part of crock pot recipes that you can smell them cooking all day! I hope you enjoy this delicious recipe on a cold winter day (or any day for that matter). Combine all ingredients in greased slow cooker. Cover. Cook on low 10 hrs. Serve over noodles, mashed potatoes or rice.